A new burrito has hit the Taco Bell menu and it’s called the Beefy 5-Layer Burrito. 550 calories and 22 grams of fat for less than a buck. Just 89cents for a limited time. Check out our friends at We-Rate-Stuff for a full review. Layers of seasoned ground beef, beans, real cheddar cheese and cool reduced-fat sour cream all wrapped in a flour tortilla with a special layer of warm nacho cheese sauce. Gotta love Taco Bell…shattering its own records for Calorie to Price ratio. Thanks for the mention! Overall it’s the usual Taco Bell fare, but when it’s on the value menu who cares, lol. Didn’t like it. I’m finding that I am more and more Taco Bell beef averse as I grow older. I love it! Nice and cheesy! Only 98 cents after tax. But beware of the calories! When I get this it’s usually only thing I get. It’s actually a good size too. Calories… Shmalories…. just eat a low fat, low sodium, and low carbohydrate foods for the rest of the day and fill up on this bad boy. After all, it’s not what you put into your body that makes you fat, it’s how MUCH of it. I’m not big on beans and sour cream, so I’ll never try one of these. Still, that’s a good price. Looks good. 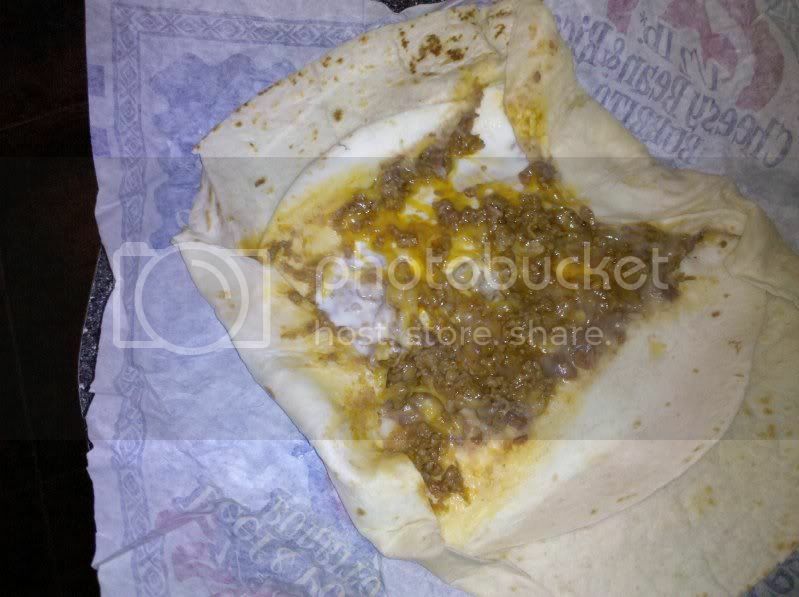 However, what I really miss is the chili cheese burrito. It was spicy and gooey and good. They have stopped serving the at the Taco Bells in MD, I am not sure if they are still served anywhere else. I just can’t figure out what happened to them. Many locations ostill have the chili-cheese burrito and I still get it often. There is actually a website which allows you to search/submit which locations have them. I tried this burrito 2 days ago. I’m not a big ground beef fan but I liked the beans, sour cream, cheese and other things in it . I was surprised at how big it was. I liked it and will get it again. I resent any Taco Bell menu item that displaced the Cheesy Gordita Crunch!!!! 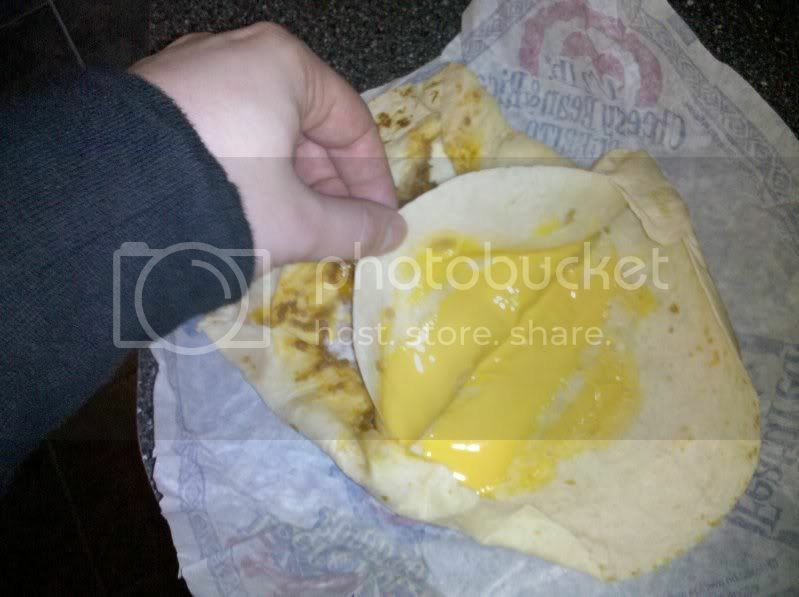 I don’t care for Taco Bell’s nacho cheese sauce. After a raging night of boozing I could probably enjoy this new burrito though, so long as the nacho cheese component is not overwhelming. get it with no beans and add baja sauce. Pretty good and a good price too! The Cheesy Gordita Crunch was awesome. The TB near me has it for $2 each when I asked for it. Im eating one right now as i type ROFL. I ate one yesterday, too many flavors, it was deplorable to say the least. 550 calories in this bugger…sigh, sorry heart. My biggest “beef” with this menu item is the two tortillas tends to overpower the filling. One tortilla can leave you with a doughy mouthful, and two only exacerbates the problem. Otherwise, this is the value item of the year, puts BK’s $1 double cheeseburgers to shame. Tell me…truthfully….do you responders ALL look like “Comic Book Guy” on the Simpsons? Eh, they’re pretty tasty, kinda small though. usually takes 2 or 3 to fill me up, but. if thats all I eat in a day i’m usually pretty good. I ate 20 of them in one work week, gettin a lil sick of them, had to switch it up for a delicious cheesy gordita crunch every once in awhile now. those tostadas are pretty good too. for 3.29 theyre pretty huge.